As I prepared for the 12-hour trip to Oklahoma facing me the next day, I happened to check my Facebook feed. Greg Allen, owner of Bend of the River Outfitters in western Oklahoma had just uploaded several trail-camera pictures of bucks on his leased properties. Every one of the bucks was big, but one was mature and had an impressively wide rack; it caught my eye. The following morning, my longtime friend, Chad Cooper, and I made the drive to Oklahoma. Although he and I reminisced about past hunting trips and such, my mind traveled a course of its own, thinking about the wide buck much of the time. We arrived late that evening, and I was excited to get into a tree the next morning. When morning arrived, the weather was perfect, with a strong, favorable wind and overcast conditions. An hour before daylight, Greg walked me into a set where the wide buck had been captured on trail-camera several times in the past week. Greg and his head guide, Josh Keith, had hung this stand and another nearby to hunt the south winds that would be present during the first few days on my hunt. As I sat in a small cedar tree in the darkness, I couldn’t help but daydream about the wide buck that was frequenting my stand location. As the first few sun rays crept over the horizon, there was just enough light to reveal a couple dark figures. The figures, two deer, moved from my left to right and toward the corn feeder 35-yards away. My anticipation level rose with the morning sun. Finally, it was light enough to make out the two deer at the feeder; a doe and a fawn. After a few minutes the two deer gave their full attention to my right, and soon after a young buck scampered in, chasing the doe away, and then the fawn. After munching on a few corn kernels, the buck grunted a couple of times and moved off to my left. I was sure the big buck would appear next, but instead just a couple sets of does with their fawns came my way. About mid-morning the wind had picked up and rain showers were forecasted, so we headed back to the lodge for a quick bite and to warm up. That afternoon, the wind was still blowing from the south, so I went back to the same stand—a hang-on treestand in a small cedar—overlooking a travel corridor where deer travel from the plateau to the river bottom, and a corn feeder to make them stop during their travels. The rain had set in, but wasn’t much more than a sprinkle. I wasn’t going to let a little water get in the way of an opportunity to shoot a mature whitetail with my Mathews Halon, so I donned my rain gear and got back in the tree. Early in the afternoon I caught movement about 70-yards out. The deer-shaped blur disappeared behind a large cedar tree, and when it reappeared, it revealed a large 10-point rack. I assumed the buck—not seeing any does near the feeder to chase—would make its way to my left, offering me a shot at about 40-yards. Instead, after surveying the feeder, the buck moved down the hill toward it. About halfway there the buck stopped to check things out one more time. Most the buck’s body was hidden in the tall oak brush, so a shot was out of the question. As the deer neared the feeder something caught it off-guard, and the buck spooked. After regaining its confidence, the buck walked right behind the feeder and off to my left, where my shot window vanished behind several trees. I panicked! Quickly, I offered two grunts to get the buck’s attention. It worked, but the buck stopped and did not move my direction. Without much of a choice, I decide to sound a couple of doe bleats. The buck was not impressed, and whirled and bolted up and out of the small canyon. My heart sank! For the next few days the wind was wrong to sit the same stand, so I sat a few different stands. I saw a few deer, but no mature bucks. Four days later, the wind shifted once again, I made way to the small cedar tree in the dark. In the pre-dawn hours, I caught movement directly behind the feeder. Right away I knew it was the wide-racked buck I was after. Although it appeared the buck was staring right at me, I carefully reached for my bow. The buck stopped behind the feeder, staring in my direction. I gave up on getting the bow into my hand, thinking the buck had made me. After just a few seconds, the buck whirled and left. I couldn’t believe it! I could only assume that the buck saw me, but I had no way of knowing for sure. Later, when the sun came up, the dew on the top of the feeder and the oak bush turned to steam, it was then I knew what had happened. When the wind was strong the steam rose, and came in my direction. However, when the wind died down, the steam rose and went away from me—the buck had winded me. Regardless, I had this buck within 40-yards of my stand twice, but still hadn’t managed a shot opportunity. It was disheartening. After returning to camp for a quick bite, my guide, Josh, and I discussed options for the afternoon. We decided to go check a trail-camera on a feeder near the second set above my morning stand location. Walking the small road in, we observed several fresh scrapes. We were hopeful that these had been left by the wide buck. Several trail-camera pictures showed that in between my sightings of the buck, it had spent much of its time on the ridge above my original stand location. As quickly as possible, I got my gear together, made an estrous doe drag line, and made my way to the new stand. I climbed in and settled for the afternoon. At 430PM I caught movement coming down the small two-track trail toward the stand. Without hesitation, I reached for my bow. Of course, I assumed it to be a deer, and the buck I was after. It was a doe, followed by a button-buck fawn. The two deer stopped 20-yards in front of me, and almost immediately looked off to my left. After a few seconds, they returned to feeding along the road. It wasn’t long until they were back on alert, looking back in the same direction. The wind was blowing in my face off and on. I glanced to my left and saw a small cedar tree whipping around. I attributed the movement to the wind, and focused my attention back on the deer in front of me. However, when the wind stopped, I noticed the small cedar still moving. Right then, I caught the glimpse of an antler and immediately knew it was the wide buck. My bow was still in my hand, and I readied it for a shot through a small window of branches to my left. Once I recaptured myself in the here and now, I let Josh know the wide buck was down and to come get me and the buck. When he arrived, we celebrated the harvest, loaded up the buck and my gear, and made our way back to camp. While we were field-dressing and skinning the buck, Chad and Greg arrived back at camp. That evening, around the dinner table we discussed how well that plan had come together. 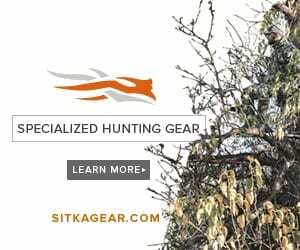 It’s true, all hunting, especially whitetail hunting is a series of strategies and plans mixed with a dash of luck, but it is extremely rewarding when the plan you make comes to fruition. When I conjure up memories of this hunt, I will always remember the well-laid out plan that came together like no other. The Mathews Halon 6 and the Easton FMJ6 were the perfect combination for the author to harvest a great Oklahoma buck with Bend of the River Outfitters.